Indian star Rahul Dravid was left lamenting a missed century after falling late on the opening day of the third Test against Australia but defended the shot that brought his downfall. Back in his favoured position at number three at the WACA, Dravid teamed up with Sachin Tendulkar for an important 139-run partnership and seemed set for his first century of the series. However, on 93 he spooned a gentle off-spinner from part-timer Andrew Symonds straight to Ricky Ponting at mid-off. It was a crucial wicket for the Australians as they fought back in the final session and Dravid was furious as he walked off, several times swinging his bat at the ground in disgust. The loose attempt to loft the ball over the on-side was at odds with his guarded approach throughout his 276-minute vigil at the crease and he was disappointed with the timing of his dismissal. However, he said the shot was there to be played. "The shot was on," he said. "I had played the same shot earlier. "When you connect it looks OK but when you don't it looks pretty stupid. "It was disappointing, especially coming so late in the day with the new ball coming." 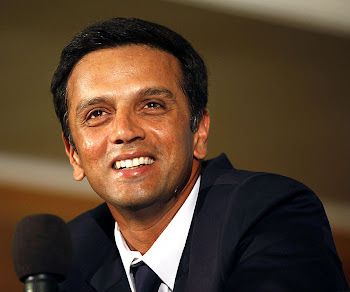 Dravid said he was mindful of trying to be positive at the crease, having struggled to keep the scoreboard ticking over as an opener in the first two Tests. "It's a fine line between trying to be positive. A lot of times you play shots and they come off and it's fine," he said. "We've also discussed about trying to have a positive mindset." Dravid, who faced 183 balls and hit 15 fours, admitted he was pleased to be back at number three after his stint at the top of the order.